Bridgeport honors the local men who served in the Civil War with an elaborate monument in Seaside Park. The monument features a large, granite base with several decorative elements that narrows into a shaft topped by a bronze allegorical figure representing the United States. 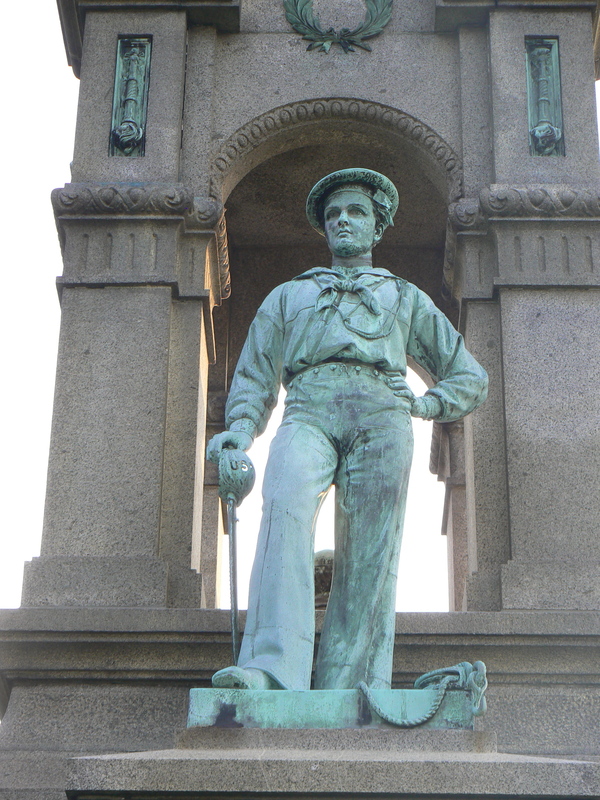 The monument’s side feature bronze statues depicting an infantry soldier and a sailor. A plaque on the front (southeast) face reads “Dedicated to the memory of the heroic men of Bridgeport who fell in the late war for the preservation of the Union. July 1876.” The plaque also features the conclusion of the Gettysburg Address. Plaques on the other faces list approximately 180 local residents killed in the war, along with their unit, as well as their date and place of death. The empty, arched niche between the two figures originally held a marble statue, representing Liberty, that was removed due to deterioration. The marble statue is visible in the second vintage postcard at the bottom of this post. 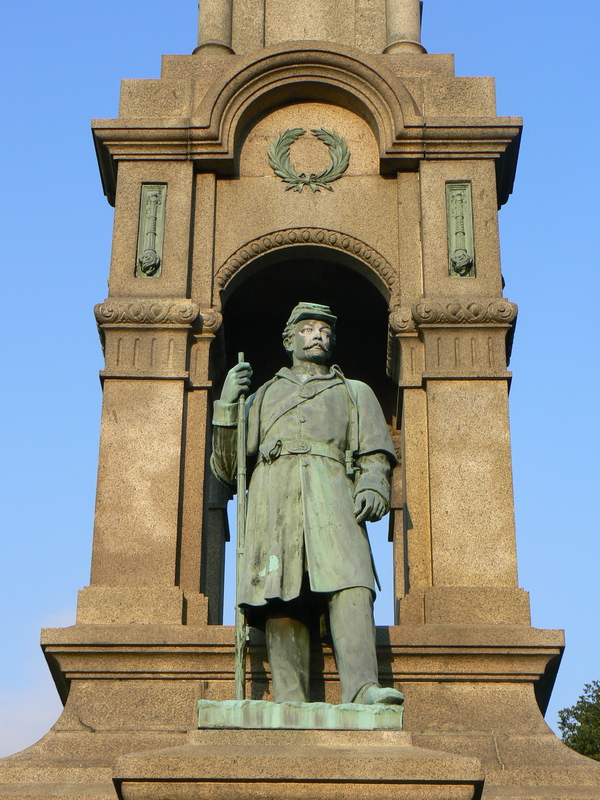 The three bronze figures were created by Melzar Mosman, who was also responsible for monuments in Middletown and Danielson, as well as the figures on the monument in New Haven’s East Rock Park. 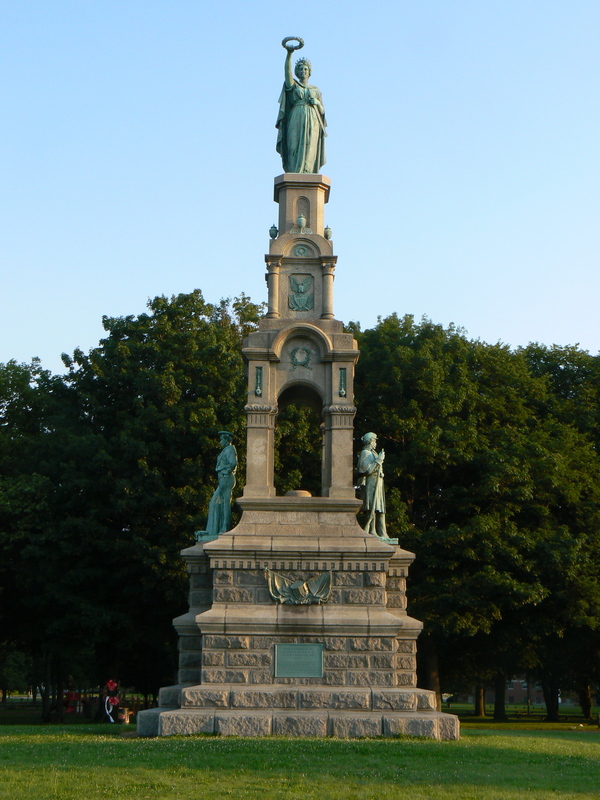 The monument stands on the former training grounds of the 17th Regiment of the Connecticut Volunteer Infantry. The popularity of venturing to the coast to watch the troops train helped lead to the creation of Seaside Park after the war.